For those of you in “perfumeland” who know me well I need not reiterate that SonomaScentStudio is my absolute favorite perfume house EVER (surpassing Chanel, Guerlain, etc). In my opinion every fragrance that the perfumer Laurie Erickson has created thus far is outstanding. Given my new found love for naturals and essential oils I have been hounding Laurie for quite some time to add natural fragrances to her line. My wish came true when she released Cocoa Sandalwood this past winter. Now, following in its footsteps is the recent release of all natural Spiced Citrus Vetiver. When I wear Spiced Citrus Vetiver my mind instantly envisages a ballet. Not surprising, given that I was once a professional ballet dancer. Please join me in this production as the curtain rises. Fragrance Notes: Blood orange, bergamot, ginger CO2, cinnamon bark CO2, clove bud absolute, jasmine sambac absolute, osmanthus absolute, Sri Lanka vetiver EO, Indonesian vetiver CO2, Virginia cedar, Indian Mysore sandalwood EO, vanilla. In the opening adagio the graceful pas de deux of our principal ballerina (vetiver) and her leading male dancer (blood orange) is supported by a pas de trois of soloists (ginger,cinnamon and clove) who jete around the couple whilst the corps de ballet (jasmine, osmanthus, cedar, sandalwood and vanilla) pirouette stage left and stage right. The prima ballerina (vetiver) does not take center stage in this ballet but rather bourees around the all the other dancers throughout this ballet. Vetiver (Suzanne R Banks’s blog post on vetiver) is an essential oil that I have recently grown to adore (The Fragrant Man). Laurie’s usage of vetiver has been masterfully blended in an utterly unique way. The vetiver is subtle yet appears throughout this composition, constantly changing on my wrist. A gracefully executed fragrance that is perfect for both male and female fragrance wearers. Given that it is all natural, Spiced Citrus Vetiver sits close to the skin and is the perfect scent when one does not want to offend the ‘perfume adverse” crowd. For a natural eau de parfum longevity is excellent on my skin. I pair Spiced Citrus Vetiver with Organic India’s Original Tulsi Tea. Tulsi, or holy basil, is renowned in India as an herb with healing properties that relieve stress and protect the immune system. The earthiness of this tea lends itself beautifully to the grassy quality of the vetiver in Spiced Citrus Vetiver. Do grab a cup of this relaxing tea whilst wearing Spiced Citrus Vetiver : sit back and enjoy the ballet! Perfume and Tea Pairings GIVEAWAY! 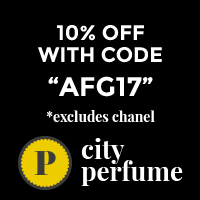 Open to everyone worldwide who leaves their favourite perfume note or essential oil in the comments section. Entries Close Thursday 10th May 2013 9pm AusEST and winners will be announced in a separate post then. Winners will be chosen by putting names on same sized papers, folded similarly, put on a tray and Brie’s family will pick a winner. The winners will have till Monday 13th May 2013 to get in touch (portia underscore turbo at yahoo dot com dot au) with their address or the prize will go to someone else. I’m a fellow devotee of Laurie Erickson’s work, and I love her florals best. I haven’t smelled her naturals yet. I really love the way she combines the best of natural and synthetic. My favorite note in perfume is the complex and beautiful vanilla CO2, and my wish for Laurie is that she do a vanilla scent, because it will be a beauty. as a fellow vanilla fiend I love that idea…and it would be a wonderful addition to her natural line! Start badgering her now please. I need it too. Nice and rich and full, with some floral lightness perhaps, but no weird woodiness thankinglymuchly. What a great description of Spiced Citrus Vetiver. Fantastic! And you paired it with some tea, which is my another guilty pleasure! Thank, Lucas! Indeed perfume, tea and chocolate are my three vices! WHy is tea a vice? It is good for you! For me tea is a vice and a crutch because I cannot survive without it…drink about 8 cups a day..hubby says there is tea rather than blood coursing through my veins! Fave essential oil is Egyptian musk. egyptian musk is one of my favorite perfumes! thanks for stopping by! Hoping to find a favorite. I love geranium essential oil! Great choice reneeg! I love the combination of tea and perfume! There are some teas that I wish I could wear as perfumes, and actually some perfumes that would taste awesome as tea! My favorite perfume note changes from week to week but right now I am very fond of tobacco, smoke and leather notes. My favorite essential oil would have to be cedarwood. I concur wholeheartedly as I am always seeking out tea (as well as food for that matter!) with perfume notes in them! I have a huge organic lavender essential oil bottle with me at all times..life can be stressful, right? nothing more soothing than lavender! Sonoma Scent Studio fragrances are fantastic! Vetiver – love it’s earthiness and would love to try this new one. For me, I love deep, rich, complex vanilla’s and spicy incensey notes the best. Thanks for offering the sample! If you love SSS and you love Vetiver then you would adore this fragrance, Mary! My favorite perfume note is probably tuberose or incense. Pretty wide range there, eh? I’m just starting to explore Sonoma Scent Studio, so thank you for the draw! do explore…SSS has some wonderful offerings! Tabac Aurea is a glorious scent for the Autumn weather in my neck of the woods (upstate NY)…you have great taste! Aldehydes Lily is my favorite Perfume note, sweet and crisp, just love it. I love seeing these articles out there from you, Brie! Brava! Brava! Brava! What fun to describe a perfume in ballet terms too. Love it! Favorite perfume note? Argh. I can’t choose. Iris? No, amber. Wait, vanilla. Erm, benzoin. Incense. No, citrus! Argh! I know i would be stumped if I had to answer this question as there are SO MANY essential oils that I adore!!! Good to see you out of hibernation :D!!!! As of today, my favorite note is irs. There are so many different iris scents – from earthy/rooty to leafy and then powdery. Last week I was sniffing some lavender iris flowers blooming in a yard, and their natural scent was so lovely. Lavender Iris flowers…oh, Nancy…I would love to be sniffing those! clary sage along with a few of cammomile, in about half a litre of milk, and the put into my bath water. Guaranteed to sleep like a baby. Hi CQ! i missed you!!! while visiting your relations if you are in close proximity to Laurie’s studio you really should see if you can stop by…SSS is NOT to be missed! I will make you a convert (am up for the challenge!). Curious, have you ever put any fragrant oils in your cookies?? Sometimes I have to put my work before fragrance blogs!! Nope. No fragrant oils. Although I do use chocolate extract. That is fab stuff!! I know CQ…just saying I love seeing you here! but cookie making is top priority and I know that you do it so well :D!!! Chocolate extract…yum! I have actually used cocoa absolute in some of my blends….rich and gorgeous, I say! My favorite scent would be pure Valencia orange oil mixed with galaxolide musk. My favorite essential oil would be lavendar. Valencia orange and musk…that sounds dreamy, dremybluz!!! Ooooh! another vanilla lover says the one who used to wear vanilla extract on her wrists…I agree, Amria…vanilla is exquisite! My favorite EO is lemon. I love it on savory and sweet food. Lemon is lovely and works quite well as a top note! Agree! 🙂 I love deep perfumes that have citrus top notes, such as classic chypres and Shalimar. And as an essential oil, I must admit lemon is my favorite, since I use so much of it. And not only in food (although it’s a must in my marinades and in many sweet confections). A few drops in the coconut oil I use after shower makes it so delightful. And mixed with alcohol and water it makes the perfect home cleaner, suitable for those of us who have small kids “licking” the floor. But since we are talking perfume, I’d like to give an honorable mention to frankincense drops. I love to have some unburned scenting my living room! Goodness solanace…you are an essential oil blender like me! I adore organic virgin coconut oil mixed with blood orange essential oil…slather it all over my tiny body in the summer as a moisturizer…but I adore this idea of using lemon essential oil as well! Yes to frankicense too! mixed with argan oil makes a great face moisturizer and has anti-cancer properties…. oops, sorry P…we are supposed to be talking perfume :D!!! I have too many favorites to pick just one but if I have to choose right now I’ll say incense. I also love lavender essential oil. An hour from now it might be different. Oh Poodle…you are too funny! I am just like you…always changing my mind as to which essential oil or perfume note is my favorite…heck, I love ’em all!!! I have been looking forward to trying SSS Citrus Vetiver for so long! 🙂 I have not tried many essential oils, but my favorite perfume note is sandalwood. I love woody scents in general, which is why I think I like so many SSS perfumes. o happy to be in the company of another sandalwood lover! and Spiced Citrus vetiver is a welcome edition to the SSS line up. OOPs…that was supposed to be a “so”…sorry I am only on my first cup of tea! So hard to choose but sandalwood is my favourite note – nothing comforts like its sweetness. Oh yes! I am so happy to hear that there is yet another lover of sandalwood….it comforts me as well, mridula! It’s so great to read about fragrances that aren’t flanked by pop princesses and actresses with little information about the product they’re pitching. Thank you for writing about truly new and different scents to try! My favorite note now is amber. Essential oil would be grapefruit. Agreed…..SSS are high quality perfume…do check out the SSS website…Laurie does a fantastic job of describing all of her perfumes as well as attaching links to all reviews…amber and grapefruit….yum! Isn’t it hard picking just one??? Thanks for stopping by! Brie, I’m glad you’ve got your new favorite! And the pairing sounds god. All good things come to those who wait, right, Undina! “Good” only knows I waiting long enough for the release of Spiced Citrus Vetiver :D!!!! Favorite perfume note- too many to list. Favorite EO – Lavender,soothing and uplifting. I am with you Brie on chocolate,perfume and tea, they are the 3 essentials in my life. Agreed rosiegreen! and I think I am going to adopt your stance and call my three favorite things in the whole wide world “essentials” rather than “vices”!! Egyptian musk is a dear, warm friend. I adore it’s closeness. I love fresh notes like ISO E super. I love a variety of musk notes. I love Laurie’s Cocoa Sandalwood the notes are gorgeous in that!! I would not be complete without my fragrances! Beth I completely agree! I too would not feel complete without my scents! Laurie does some true magic at SSS. I love all of her many woodsy fragrances. By favorite note has always been Sandalwood, although incense, labdanum, and leather are also favorites. Right now, I’m wearing (and huffing) her Ambre Noir. Thanks for the draw. I also adore sandalwood…and happy to see another SSS fan! Ambre Noir will be calling my name come Autumn! I’m going to say heliotropin, but it’s tough. My runners up are violet, anise, blood orange and bergamot. I think I tend to like powdery florals and bright citrus. Florals are lovely as are citrus notes! Based on the notes you have listed I think you would also like SSS Lieu de Reves (one of my favorites!). Lovely review, and thanks for the giveaway! I tried a rose tulsi tea that a friend who was very into aromatherapy gave me–it was delicious! would love to try more. Cannot choose a favorite EO or note for the life of me. I love vetiver a lot, actually, along with black hemlock, sandalwood, frankincense, cedar, mitti, lemon, amber, and saffron and vanilla and milk also. And spices like clove, pepper, cardamon, cinnamon, ginger, coriander… Any scent that is mostly one of these will probably be a favorite. But I think if I had to choose one it would be a coin toss between saffron and vanilla. Have been meaning to explore SSS for a long time now…read so many great things! mim- completely agree….choosing just one favorite EO is impossible ! yes, the Tusli Sweet Rose and Cinnamon Rose teas are divine…( I have tried almost every Organic India Tusli that is out on the market). and please do explore the SSS line! My favorite perfume note…kind of like picking my favorite child, isn’t it? But I think it would have to be jasmine – which makes my favorite essential oil the same! As a mother of three I have to say…well put! OK, I normally don’t enter the draws here at APJ anymore because it feels a bit like cheating, but for the chance to smell this new SSS, I’m breaking my own rule. Favorite perfume note is orris root. Oh yeah.